Many people look at a thatched cottage and don’t realise that the materials used for thatching are not all the same. As we have explained before the main materials used now are Water Reed and Straw. Thatching Straw was a bye product of cereal production and oat, barley, rye and wheat are all cereals. Less well known is that the straw which is especially grown for thatching is mainly wheat straw and not of the same variety as now being seen harvested with a combine in the fields in the summer. Wheat straw is grown and then harvested and produced with expert knowledge and equipment either to make Longstraw or Combed Wheat Reed/Devon Reed. Our network of specialist contacts and friends, includes the National Thatching Straw Growers Association (NTSGA). Their Chairman Stephen Letch (who is a grower and a thatcher) and one of our Thatch Advice Centre Associates, has kindly written us some important and very interesting information on Thatching Straw and varieties, see below and provided us with some useful pictures too. There are also links on the pilot research project carried out by the NTSGA and a ‘Growing Straw for Thatching’ guide. 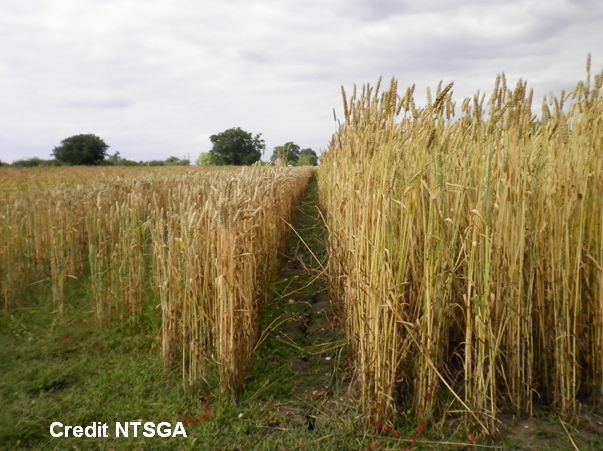 “Most thatchers will know of the more commonly used wheat varieties grown such as Maris Huntsman (introduced 1972); Maris Widgeon (introduced 1963) and Aquilla (introduced 1976). Many will not be aware that these varieties are recent arrivals and were bred as shorter crops to suit modern farming rather than for use in thatching. None of these varieties grow particularly tall under low fertility (nitrogen) and need high inputs to gain any length in the stem, they are a favourite with commercial thatching straw growers mainly because of their relatively higher grain yield than can be achieved compared with old wheat varieties and can with care and attention to the growing regime produce fairly consistent yields of thatching straw for combed wheat reed or long straw. Many thatchers have only used these varieties because that is all that has been available to them so they try to thatch accordingly with shorter straw than their thatching ancestors pre 1950’s would have used. These semi modern varieties are fine for spar coating long straw up to say a 300 mm thick specification but it does mean more yealms and fixings to cover the same area of roof compared with for example Squareheads Master/ Red Standard from the 19th century which would average 30 to 40 cm longer straw. For new work fixed to rafters @ 400mm thatchers would be wise to use the older taller varieties. For spar coating combed wheat reed at any reasonable thickness one would be best advised to avoid Aquila as it has the shortest average length of them all @ 75cm grown under low fertility husbandry, because of pan back and poor pitch to both the thatch and the roof rafters especially in the west country regions. 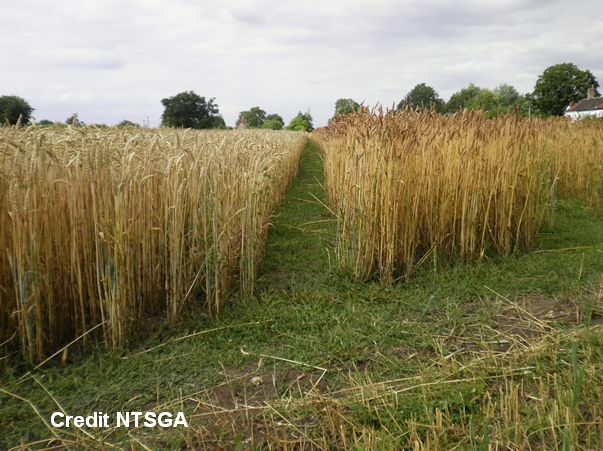 Use of these semi-modern varieties for combed wheat reed in the western half of the UK has been problematic and may explain why both growers and thatchers have in recent decades opted for Triticale (half wheat/ half rye) which is taller and more disease resistant growing in the field. N59 introduced in the 1950’s is still a firm favourite in parts of the West Country, this is a semi-solid straw that lends itself well for use in combed wheat reed thatching. Ridging- Most thatchers prefer longer stemmed wheat’s for ridge work. By the late 1970’s most straw growers had abandoned their old stocks of Squareheads Master, Little Joss, N59 and Victor in favour of growing the modern varieties mentioned above in the belief they could produce higher margins of both grain and straw. However there were still growers and thatchers that felt comfortable with the old wheat’s, which meant seed stocks of some old varieties were saved and valued despite not being on the registered EU seed list that favours the multi-national petro-chemical companies financial interests who own the seed rights to more than 70% of the worlds crop production. As we are law abiding conscientious growers and thatchers, the National Thatching Straw Growers Association in conjunction with Historic England recently ran trials of wheat varieties old and modern that are consistently reliable for growing up until harvest, with the view of registering the ones of most interest as conservation varieties so the seed can be legally made available to thatching straw growers. We appreciate all relevant and useful contributions to our expanding website so please feel free to get in touch. All contributions will be credited to yourselves.